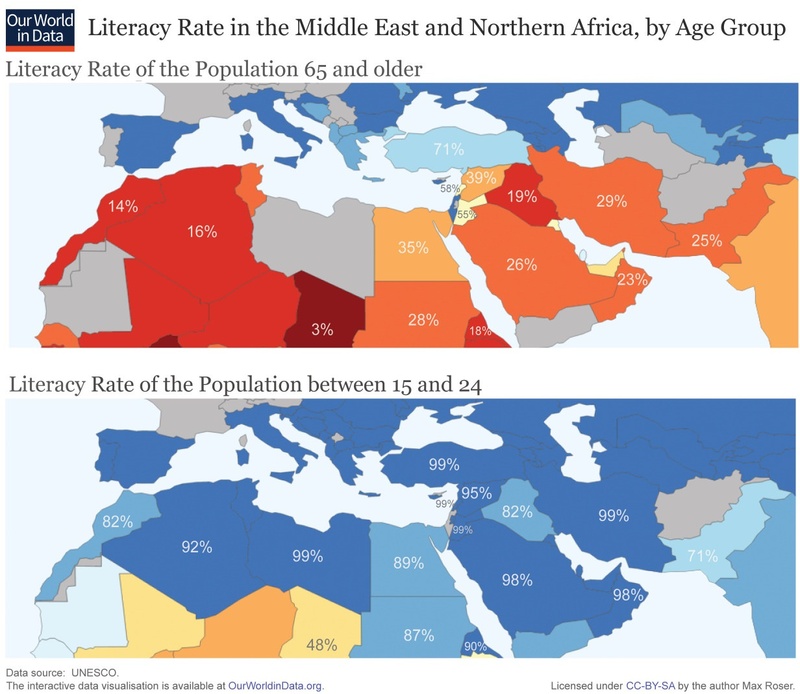 Young people in across the Middle East, Northern Africa, and Central Asia have literacy rates as high as most of Europe and the United States. The difference between the young and old is especially striking. There is a strong correlation between literacy and life expectancy, employment, and income, thus creating higher opportunity costs for violence and anti-social behavior. Simply put, on average, being able to read makes violence more costly. If we accept that there is a connection between literacy and liberalism — between the ability to absorb and process abstract ideas (regardless of their source) and to mentally put oneself "in another person's shoes" (even if you have never seen that person or anyone like them), and the tolerance, empathy, and humanitarianism that have characterized the progress of Western civilization and the decline of violence — this is very good news. Hat tip: Bill Easterly. Chart source: Our World in Data.